My husband and I have treated this trip as a second honeymoon – the last some 25 years ago when we first came here to scuba dive. During our first visit to Belize, we explored the Northern Cayes & Atolls including Ambergris Caye, the largest of the islands with an already mature tourism infrastructure. 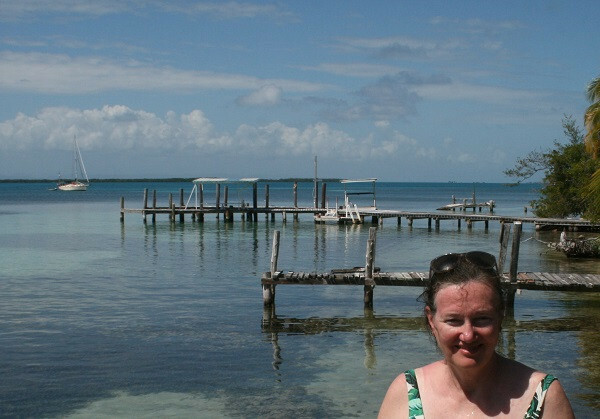 Also on the list was Caye Caulker, an island that appeals to backpackers and those seeking a more laid-back holiday. While a couple of the atolls offer shore diving, snorkelers and divers access the reefs off Ambergris and Caulker by boat as they are located anywhere from 15 minutes to one hour away. Now we have come to explore the Southern Cayes and atolls that lie approximately one hour from our base, the coastal town of Placencia where a mixture of mega square foot mansions and funky colourful wooden houses cater to an equally diverse set of travelers and locals. We visit Splash Dive Centre shortly after arrival http://www.splashbelize.com and know we are in capable hands. This is a full PADI centre offering training, snorkeling and scuba trips. Equipment is plentiful and well-cared for. Staff also plentiful, are safety and service-oriented. We discuss our hopes of going to Glovers Reef, an atoll 30 nautical miles from Placencia. This will only be possible with enough advanced divers and favourable weather conditions on the sea. Our first day is spent diving two sites off Silk Caye. Matthew and I are joined by two divers, one from Switzerland, and the other from Germany. The four of us depart along with dive masters from Splash (Sam and Dan) & our Captain, George. At first, we hover over sand and coral gardens and arrive at a wall that drops deep beneath us, fading into azure depths. We are able to drift almost effortlessly by crevices that harbour lobsters of impressive stature. We move between 90 and 60 feet. Two green morays come out to provide us with full views. Lunch and surface intervals are spent on the Cayes, and we wonder what took us so long to come back. The afternoon will be a shallower dive at another of the many reefs here. This outing presents us with several Nurse Sharks, large groupers, and so many tropical fish that I wish I knew the names of. I do spot some angels, damsels, parrotfish, triggerfish & a small black & white, ornate fish which performs like a graceful gymnast on the marine floor. On another day, we dive off a small private island, one of many that dot these waters, but our favourite adventure is found off South Water Caye. At fifteen acres, this island is large enough to support three small resorts. It has a sandy beach and a cute restaurant bar at the IZE resort for our surface time, as well as fisher folk arriving on charter boats. Wow! Wow! Wow! best describes this day. An 80-foot wall dive with two large Spotted Eagle rays gliding by, quite literally – they did not flap once. We also pass over a series of ridges draped with life against a backdrop of deep blue ocean. The visibility on this day was well in excess of 100 feet. The dive conditions could be considered advanced, with fairly large swells during entry and exit. Moray, trigger fish, grouper, lionfish, pufferfish, and swarms of colourful fish were all present along with Nurse sharks, a good-sized grouper and a Loggerhead Turtle. Array of corals including large Gorgonian fans are the architects of this spectacular site. Perhaps the best memory is of a flock of 15 spotted Eagle rays doing a pass by. On board – everyone was quiet, stunned by the drama and beauty. Before heading back to shore, we stop for a snorkel at the fishing grounds where three species of rays, a Loggerhead Turtle and more Nurse Sharks feed off the scraps left from the three small fishing boats seeking conch, lobster and hogfish. There is concern by many that in addition to “overfishing, deforestation, offshore oil drilling, pollution and climate change, the reef is compromised by large-scale, irresponsible tourism and indirect industrial development that not only threatens the integrity of the marine ecosystem but the wellbeing of the two million local people who depend on the reef for their lives and livelihoods.” (The Mesoamerican Reef Tourism Initiative https://mesoamericanreef.org/about-us/ They are just one of the NGO’s working in the area leading efforts to maintain a vibrant tourism industry that can support local communities and contribute to a healthy ecosystem for the 500 species of fish, 60 species of coral, sea turtles, sharks, manatees and dolphins that live here. Don’t litter! When straws, plastic bags, fishing lines and other debris ends up in the ocean, it can be lethal to sea turtles and other marine life. Use re-fillable water bottles and carry your own cloth bags to convenience stores. Do not buy or consume unsustainable sea products. This includes turtle meat, eggs, and oil, as well as souvenirs made from shells, or coral jewelry. Use discretion with the use of lights. Artificial lights can scare and disorient wildlife or make them more vulnerable to predators. Use local guides who are members of the Tour Guide Association and are trained in both tourism and conservation. Share your love of reefs to others you meet!